Let’s talk about the Coleman Lay Z Spa Hot Tub Review and how this very affordable Hot Tub can bring joy to your family and friends. With a beautiful green colour, a large siting capacity of up to 6 adults and an easy set-up, this can be the perfect gift for yourself and the entire family. The initial set-up﻿﻿ is very fast, it takes about 10 minutes to inflate it and another 30 minutes to fill it up with water. Have your friends over for a movie and pizza and end the evening with a relaxing warm massage in the Hot Tub! 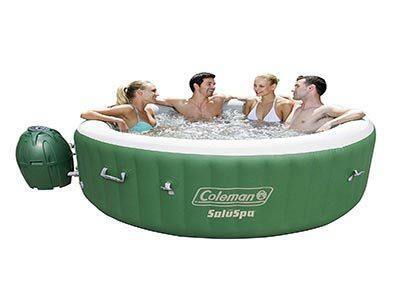 This is one of the best inflatable hot tub by Coleman comes in a beautiful green color that looks great in the garden. Installing it takes just a few minutes it inflates using the spa’s pump without any other tools. The Lay Z Spa is designed with 3 layer reinforced materials that’s made to withstand 104 degrees water temperature. Inflated, it measures 77in x 28in with a water capacity of 254 gallons, that’s enough to fit 4 to 6 adults. Digital Control Panel can control the heating system and the water filtration. It can also be used to turn on the Lay Z Massage, powering on 120 bubble jets for a relaxing massage. The strong I-Beam design by Coleman makes it superior to other Hot Tub’s in its class allowing the users to sit on the walls without the Hot Tub bending giving you the feel of a high quality Hot Tub. Weighting just 88 pounds makes it easy to move. This also is makes it good for when you want to take it along when you going on holiday. The price is also reasonable, makes it a great value for your money. Think of it as an investment, instead of paying a fortune to go to a public pool that you don’t even like, you can have a personal Spa in your back yard! The thing I personally love about this hot tub is the comfortable floor. This floor has constructed with cushioned air pad. On top of the tub, there is an additional comfort under foot and backside.This features is greatly helpful for insulation and minimizing the loss of heat through the base of the spa and keep you comfortable inside of the tub. The Lay Z Spa Inflatable Hot Tub by Coleman is fun for the whole family and even all of your friends with a seating capacity of up to 6 adults. It’s going to be great at parties or family reunions. The kids will love playing with the bubbles or even learn to swim, with the help of an adult of course. The parents are probably going to enjoy the Lay Z Spa the most because it’s the perfect way of enjoying a beautiful evening with the spouse under the moons light. The students can have a lot of fun with this brilliant Hot Tub. It goes just well along a barbecue with other friends. The elders will probably benefit of the Lay Z massage the most, as it’s very good against arthritis or osteoporosis. Also, if you are the owner of a hotel resort at the mountain side this can be a very good investment as the Lay Z Spa’s beautiful green color goes excellent with the vegetation at the mountain side. If you are a hard-working person and don’t have time or money to go on vacation at the hot springs, this will be just perfect. The Lay Z Spa Inflatable Hot Tub by Coleman is a great bargain, with a water capacity of 254 gallons and a seating capacity of 4 to 6 adults at an incredible price under 400. Other Hot Tubs with a higher price almost don’t even compare to the Lay Z Spa by Coleman. For example the SaluSpa Paris AirJet Hot Tub also has a siting capacity of 4-6 people but the water capacity is only 177 gallons, you do get LED light show but the price is above than this model, I mean you use a hot tub for relaxing not for a light show. Another example is the SaluSpa Miami AirJet Hot Tub, this one has a seating capacity of only 2 to 4 people and the water capacity is again only 177 gallons, with a price of almost $500. That’s $100 more than the Lay Z Spa by Coleman. Based on previous customer feedback there are a few details about this product that need to be presented before comparing it to other Hot Tubs in its range. Water capacity of the tub is 254 gallons of water. Enough room for 4 to 6 adults. Solid structure once you fill it with air making it, ok to support yourself on its walls. It can easily be deflated and put away when you don’t plan to use it. This is a one of the best hot tubs for the money. Takes only 10 minutes to install. Needed less than 30 minutes to fill up with water. If you plan to place it on a wooden deck be careful as it might be too heavy. Takes a long time to get the desired temperature. Question: Is this hot tub suitable for the winter? Question: Is it suitable to use bromine tablet with this hot tub? Answer: Yes, this bromine tablet is recommended for this inflatable hot tub. Question: Is this model needed regular maintenance? Answer: Yes, if you want to use the hot tub for a long time, it is needed a good maintenance to keep it fit. The Lay Z Spa Inflatable Hot Tub by Coleman is a very good value for your money. If you want to give your life some excitement, if you want to surprise your friends and family with a brilliant way of spending your time with them or even if you want to use it in a medical way and keep away the pain of old age. The user reviews speak for themselves as well, with almost a 5 star rating this makes it one of the top choices when wanting to purchase an inflatable Hot Tub.